Bishop John McAreavey has sharply criticised the illegal settlements of Israelis on an area of the West Bank. 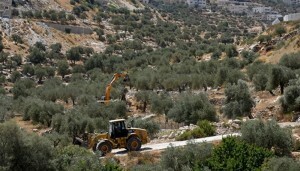 This is happening on a scale that “is making the idea of a two state solution increasingly difficult,” he told CatholicIreland.net. Bishop McAreavey was speaking on his return from a five-day visit to Bethlehem, Hebron, Gaza and the Cremisan Valley, (a stretch of fertile land on the border between the West Bank and Jerusalem) as part of a delegation of Church leaders from ten countries – the Holy Land Coordination group. He said the groups “invading” the West Bank area were “highly motivated and extremist”. The bishop compared the settlements to the 16th century plantations in Ireland. 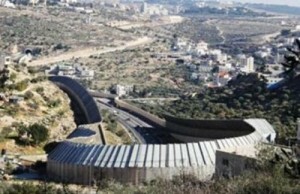 He described the 26 foot high “security wall” which cuts through the region, as “shocking”. The wall does not mark the border between Israel and the West Bank, but cuts through farms and even a school in the West Bank region. The Holy Land Coordination group was accompanied by representatives of the Irish aid agency Trócaire which is supporting a local NGO, the Society of St Yves. This human rights group founded by the former Latin Patriarch of Jerusalem and the Holy Land, Michel Sabbah, provides fee legal assistance, counsel and advocacy to members of the community. Bishop McAreavey noted that although the settlements were illegal, they were supported by the Israeli government. The Comprehensive Agreement between the Holy See and the State of Palestine which recently came into full effect states that the Holy See recognises the state of Palestine. On the trip Bishop McAreavey spoke to the Irish government representative about Ireland recognising Palestine. “It is government policy that the state of Palestine should be recognised but there are a lot of practical difficulties. In one sense it is almost a symbolic thing to do,” he said. Similarly the only way the rights of Palestinians could be protected was through a political recognition of their state. Referring to Pope Francis’ warning against the danger of a “globalisation of indifference”, Bishop McAreavey called on Irish people to familiarise themselves with what was happening in the Holy Land, “to care about it, to pray for the people there” and in any way they could to “support those groups committed to peace and to legal and constitutional change”.